This is the first game in the Dr. Mario series. 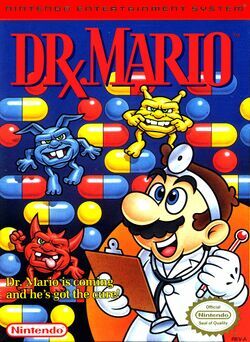 For other games in the series see the Dr. Mario category. Dr. Mario (Dr. マリオ, Dokutā Mario) is an arcade-style puzzle video game produced by Nintendo. It was originally released for the Nintendo Entertainment System and Game Boy in 1990. Its play mechanics are compared to Tetris. In this game, Dr. Mario throws vitamins that the player must align in order to destroy the viruses that populate the playing field (designed to resemble a medicine bottle). U.S. Patent 5,265,888 covers Dr. Mario, but as of 2004, Nintendo has not enforced it against amateur software developers. This page was last edited on 3 March 2015, at 01:03. This page has been accessed 18,026 times.